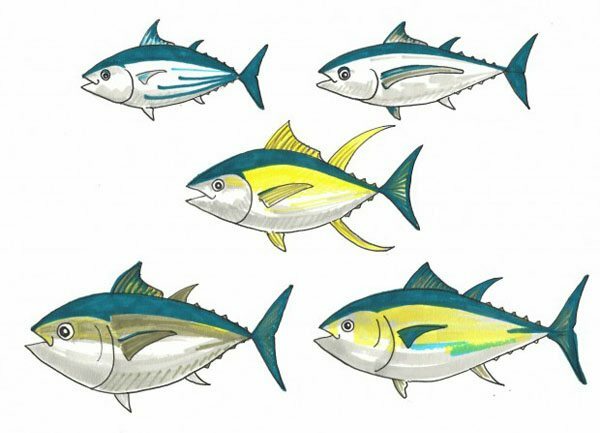 Find out how endangered each tuna species is and learn how to better choose a sustainable type of tuna. Tuna are fish, and they are wild animals. But to many people, they are simply understood as food. It can be a bit confusing when the short hand of ‘tuna’ is used, as it covers a whole family of tuna species, from the relatively-tiddly and widespread skipjack, right up to the majestic but beleaguered bluefins. So we’ve pulled together a quick guide to the tuna species you’re likely to encounter in Australia. This is not intended to encourage you to eat them, you understand. It’s just to raise awareness of what it is that is being served up, and what issues you need to think about. There are about 15 species of tuna recognised worldwide, but in Australia, you are likely to only come across a few of those. Relatively small, and the most abundant and widely-fished of tuna species. The fish can be up to a metre in length, but is rarely recognisable when served up – as skipjack makes up most of what we eat as canned tuna. Tuna chunks and flakes in brine, or oil – if it’s on a sandwich, you can pretty much bet it’s skipjack. This is a pretty abundant species, but there are still issues around how it is fished. Mostly this is because the methods cause damage to other species – which end up as bycatch. Most skipjack is caught using large purse-seine nets, and when these are set around Fish Aggregation Devices (so called FADs, floating structures that act like fish magnets) they result in huge amounts of bycatch – of other fish, as well as sharks, rays and even turtles and occasionally whales or dolphins. Using FADs has been shown to increase the amount of bycatch tenfold. Sadly many of the species caught and killed as bycatch are endangered – including several species of open ocean sharks, and sea turtles. And when you factor in the scale of the fishing operation to fill those little cans, that adds up to a whole lot of collateral carnage, including tens of millions of sharks every year. Luckily – there are better, cleaner, ways to catch skipjack and tuna companies have recognised this. All major Australian tuna brands and retailers committed to banning the use of FADs from their tuna supply chains by 2015, in response to Greenpeace’s campaign. In the meantime, look out for pole-and-line caught skipjack, or some that has been caught without using FADs. TOP TIP – only choose pole & line or FAD-free caught skipjack. Yellowfin are widespread and magnificently-streamlined fish. And, yes, they have yellow fins, including characteristically sickle-shaped elongated ‘go faster’ ones. They are found around the world, but mostly confined to tropical waters. They can grow to over two metres in length. Although most brands have switched to the more sustainable skipjack, yellowfin tuna can still be found canned in Aussie supermarkets. It should tell you on the tin what species it is (if it doesn’t, put the tin back and don’t buy it!). However, yellowfin is probably most recognisable as fresh ‘tuna steaks’ available on the fish counter and in supermarkets. You may also find it in sushi. Like skipjack, yellowfin for the canning industry are caught with purse seines, and when FADs are used the vast majority are young yellowfin that never get a chance to breed. Another method of catching them is using longlines — lines of baited hooks that can be many, many kilometres long. This method of fishing can be very indiscriminate and globally is responsible for lots of bycatch – sharks, swordfish, turtles, and seabirds can all fall victim to the baited hooks. Long lining is the main reason that global albatross populations are endangered, and as with purse seining, some of the species caught and killed are endangered sharks and turtles too. Long lining has improved markedly in Australia in recent years, so if you want to eat yellowfin then only buy fresh Australian-caught product and just do it occasionally. If the fishmonger can’t tell you where it’s from, don’t buy it. There are now real concerns that some populations of yellowfin have been totally overfished, and in many places are still plummeting. TOP TIP – avoid canned yellowfin, try fresh Australian instead, and eat it sparingly. Albacore is a cooler water tuna, and even ventures into waters around southern New South Wales and Norfolk Island. They have an unusually long pectoral fin, and are sometimes referred to as ‘white’ tuna, because of its pale flesh. Albacore tuna is not very common in Australian shops and restaurants, but you can find relatively responsibly caught albacore in cans and occasionally fresh. Much of this is independently certified by the Marine Stewardship Council. Albacore is mainly caught on longlines, but they can be caught with much more ocean-friendly methods such as pole & line and a similar method called ‘trolling’. Most populations of albacore around the world have been overfished – the only relatively healthy stocks are in the Pacific, but these are in decline. TOP TIP – choose pole & line, ‘trolled’, or fresh Australian albacore from the Pacific. With a scientific name that labels it as ‘fat tuna’, this is a big, robust fish, found in tropical waters and growing over two metres in length. Sadly bigeye tuna are in trouble, with many populations plummeting in recent years due to overfishing. It’s caught in similar ways to the similarly-sized yellowfin, you hardly ever see it in Australia, if you do it’s mostly likely in expensive sushi restaurants. There are three species of bluefin tuna: Southern, Pacific and Atlantic, and they are spectacular fish. 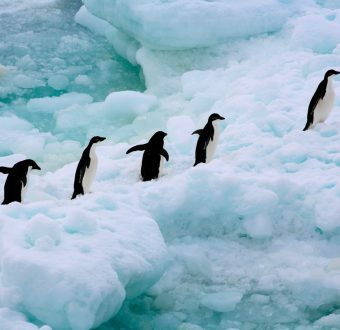 Growing to over three metres, and up to a whopping 450kg, they are warm-blooded top predators that can accelerate faster than a sports car, and are also able to tolerate cold water. 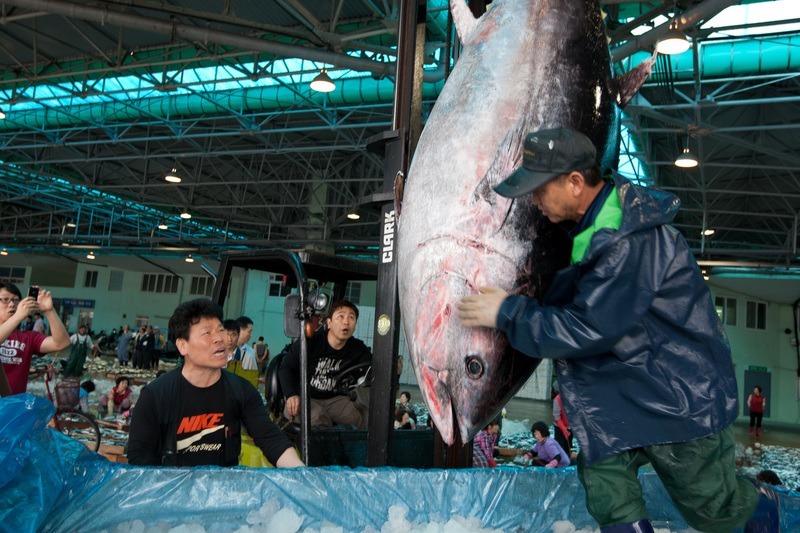 In recent years bluefin tuna has been severely overfished. 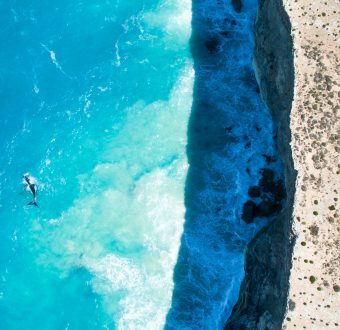 Southern Bluefin, the only type caught and sold in Australia, are already classified as critically endangered because their populations are at only roughly 5% of historic levels. There are real concerns for the future of bluefin. In Australia, you should only find bluefin in relatively expensive sushi. It may be labelled as ‘o-toro’. If you see it for sale, ask the restaurant why they think it’s okay to sell an endangered species.